Flint, Mich. – The Flint Firebirds today announced that the club has completed a trade with the Hamilton Bulldogs. In the trade, Flint receives defenseman Fedor Gordeev and goaltender Connor Hicks from the Hamilton Bulldogs. 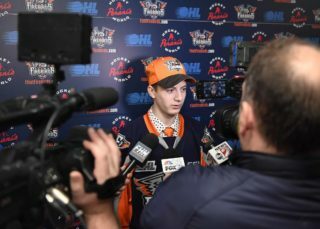 In addition, the Firebirds received Owen Sound’s second-round pick in the 2019 OHL Draft and Niagara’s second-round pick in the 2020 OHL Draft. In return, the Firebirds trade forward Will Bitten and a 12th-round pick in the 2017 OHL Draft to the Hamilton Bulldogs. 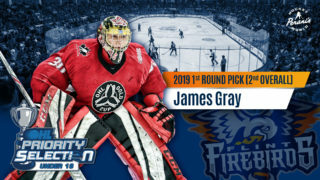 “Our team is significantly better today with the addition of Connor who is an established number-one OHL goaltender and Fedor, a top young defenseman that brings a combination of size, skill and skating to our club,” said Flint Firebirds General Manager George Burnett. Hicks, a native of Kanata, Ont., played in 30 games last season with the Hamilton Bulldogs posting an impressive 2.92 goals against average (GAA) and a .916 save percentage (SAV %) through his last 15 contests. Coming off scoring a highlight reel type goal and making the OHL’s “Top-5 Plays of the Week,” Gordeev comes to the Firebirds as a six-foot-six, 209-pound defenseman. Last season Gordeev, racked up 26 points in 44 games, scoring six times and adding 20 assists with the Ancaster Avalanche in the Greater Ontario Junior Hockey League (GOJHL). Selected in the third-round, 59th overall by the Hamilton Bulldogs in the 2015 OHL Draft, Gordeev played in eight games and earned two assists with the Bulldogs a season ago, prior to scoring once in two games in Hamilton this season. Both Gordeev and Hicks are expected to arrive in Flint this week to get started with the Flint Firebirds. 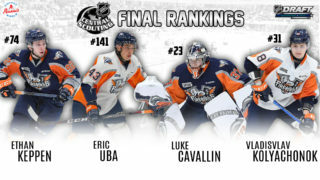 After posting 4-0 and 2-0 victories in Flint last week, the Firebirds look to stay perfect on home ice this weekend as the club hosts the Sarnia Sting at 7 p.m. (ET) on Saturday and the Ottawa 67’s at 4 p.m. on Sunday at the newly renovated Dort Federal Event Center in Flint, Mich. Single game tickets for the Flint Firebirds 2016-17 season are $12 for Bronze, $15 for Silver, $19 for Gold and $25 for VIP seating. Prices are unchanged from last season and all seats are reserved / assigned seating. Fans can purchase tickets online here at ticketmaster.com or for more information, contact Matt Dewire at tickets@flintfirebirds.com.